Cover Photo Credit: "Chaos Monster and Sun God" by Georgelazenby - Own work. Licensed under Public Domain via Commons. In the year 1914 the University Museum secured by purchase a large six column tablet nearly complete, carrying originally, according to the scribal note, 240 lines of text. The contents supply the South Babylonian version of the second book of the epic ša nagba imuru, “He who has seen all things,” commonly referred to as the Epic of Gilgamish. The tablet is said to have been found at Senkere, ancient Larsa near Warka, modern Arabic name for and vulgar descendant of the ancient name Uruk, the Biblical Erech mentioned in Genesis X. 10. This fact makes the new text the more interesting since the legend of Gilgamish is said to have originated at Erech and the hero in fact figures as one of the prehistoric Sumerian rulers of that ancient city. The dynastic list preserved on a Nippur tablet1 mentions him as the fifth king of a legendary line of rulers at Erech, who succeeded the dynasty of Kish, a city in North Babylonia near the more famous but more recent city Babylon. The list at Erech contains the names of two well known Sumerian deities, Lugalbanda2 and Tammuz. The reign of the former is given at 1,200 years and that of Tammuz at 100 years. Gilgamish ruled 126 years. We have to do here with a confusion of myth and history in which the real facts are disengaged only by conjecture. The prehistoric Sumerian dynasties were all transformed into the realm of myth and legend. Nevertheless these rulers, although appearing in the pretentious nomenclature as gods, appear to have been real historic personages.3 The name Gilgamish was originally written dGi-bil-aga-miš, and means “The fire god (Gibil) is a commander,” abbreviated to dGi-bil-ga-miš, and dGi(š)-bil-ga-miš, a form which by full labialization of b to u̯ was finally contracted to dGi-il-ga-miš.4 Throughout the new text the name is written with the abbreviation dGi(š),5 whereas the standard Assyrian text has consistently the writing dGIŠ-ṬU6-BAR. The latter method of writing the name is apparently cryptographic for dGiš-bar-aga-(miš); the fire god Gibil has also the title Giš-bar. “Oh harlot, take away the man,” says the lord of Erech. Once again the faithful woman instructs her heroic lover in the conventions of society, this time teaching him the importance of the family in Babylonian life, and obedience to the ruler. Now the people of Erech assemble about him admiring his godlike appearance. Gilgamish receives him and they dedicate their arms to heroic endeavor. At this point the epic brings in a new and powerful motif, the renunciation of woman’s love in the presence of a great undertaking. Gilgamish is enamoured of the beautiful virgin goddess Išhara, and Enkidu, fearing the effeminate effects of his friend’s attachment, prevents him forcibly from entering a house. A terrific combat between these heroes ensues,10 in which Enkidu conquers, and in a magnanimous speech he reminds Gilgamish of his higher destiny. In another unplaced fragment of the Assyrian text11 Enkidu rejects his mistress also, apparently on his own initiative and for ascetic reasons. This fragment, heretofore assigned to the second book, probably belongs to Book III. 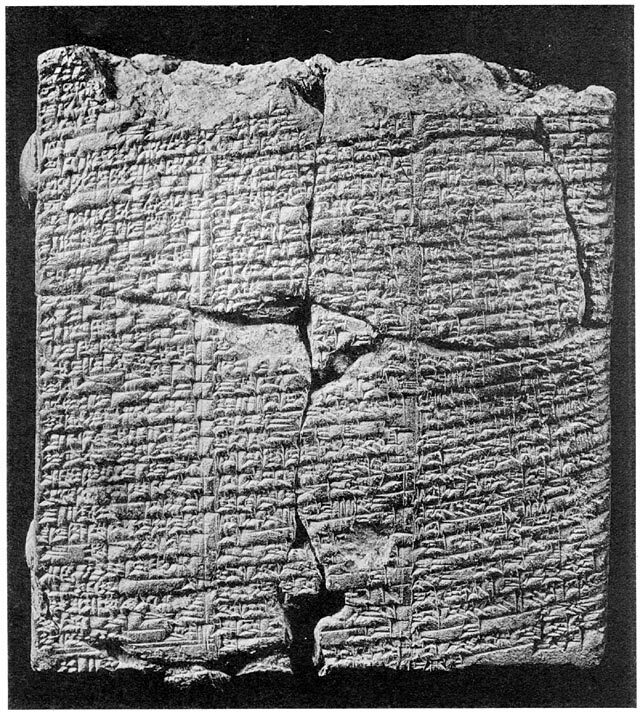 The tablet of the Assyrian version which carries the portion related on the new tablet has not been found. Man redeemed from barbarism is the major theme of Book II. 1 Ni. 13981, published by Dr. Poebel in PBS. V, No. 2. 2 The local Bêl of Erech and a bye-form of Enlil, the earth god. Here he is the consort of the mother goddess Ninsun. 3 Tammuz is probably a real personage, although Dumu-zi, his original name, is certainly later than the title Ab-ú, probably the oldest epithet of this deity, see Tammuz and Ishtar, p. 8. Dumu-zi I take to have been originally the name of a prehistoric ruler of Erech, identified with the primitive deity Abu. 4 See ibid., page 40. 5 Also Meissner’s early Babylonian duplicate of Book X has invariably the same writing, see Dhorme, Choix de Textes Religieux, 298–303. 6 Sign whose gunufied form is read aga. 7 The standard text of the Assyrian version is by Professor Paul Haupt, Das Babylonische Nimrodepos, Leipzig, 1884. 9 The fragments which have been assigned to Book II in the British Museum collections by Haupt, Jensen, Dhorme and others belong to later tablets, probably III or IV. 10 Rm. 289, latter part of Col. II (part of the Assyrian version) published in HAUPT, ibid., 81–4 preserves a defective text of this part of the epic. This tablet has been erroneously assigned to Book IV, but it appears to be Book III. 11 K. 2589 and duplicate (unnumbered) in Haupt, ibid., 16–19. 12 See also Ward, No. 199. 1 Here this late text includes both variants pašāru and zakāru. The earlier texts have only the one or the other. 2 For kakabê; b becomes u̯ and then is reduced to the breathing. 3 The variants have kima kiṣri; ki-[ma]?-rum is a possible reading. 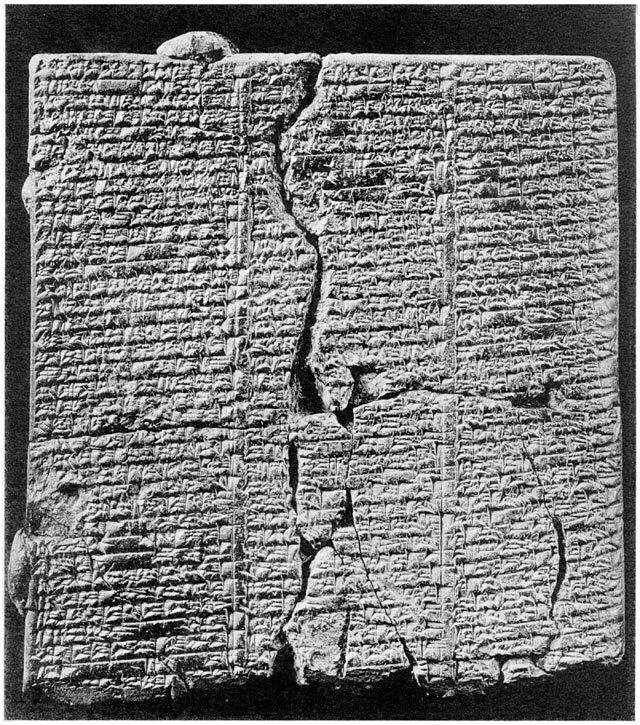 The standard Assyrian texts regard Enkidu as the subject. 5 ŠAM-KAK = ilu, net. The variant has ultaprid ki-is-su-šu, “he shook his murderous weapon.” For kissu see ZA. 9,220,4 = CT. 12,14b 36, giš-kud = ki-is-su. 6 Var. nussu for nuš-šu = nušša-šu. The previous translations of this passage are erroneous. 7 This is to my knowledge the first occurence of the infinitive of this verb, paḫēru, not paḫāru. 10 Cf. Code of Hammurapi IV 52 and Streck in Babyloniaca II 177. 11 Restored from Tab. I Col. IV 21. 12 Cf. Dhorme Choix de Textes Religieux 198, 33. 13 namaštû a late form which has followed the analogy of reštû in assuming the feminine t as part of the root. The long û is due to analogy with namaššû a Sumerian loan-word with nisbe ending. 14 Room for a small sign only, perhaps A; māi̭āk? For mâka, there, see BEHRENS, LSS. II page 1 and index. 15 Infinitive “to shepherd”; see also Poebel, PBS. V 106 I, ri-i̭a-ú, ri-te-i̭a-ú. 16 The text has clearly AD-RI. 17 Or azzammim? The word is probably an adverb; hardly a word for cup, mug (??). 18 it is uncertain and ta more likely than uš. One expects ittabriru. Cf. muttabrirru, CT. 17, 15, 2; littatabrar, EBELING, KTA. 69, 4. 19 For šapparu. Text and interpretation uncertain. uttappiš II² from tapāšu, Hebrew tāpaś, seize. 21 On ekēšu, drive away, see Zimmern, Shurpu, p. 56. Cf. uk-kiš Myhrman, PBS. I 14, 17; uk-ki-ši, King, Cr. App. V 55; etc., etc. 22 The Hebrew cognate of mašû, to forget, is našâ, Arabic nasijia, and occurs here in Babylonian for the first time. See also Brockelman, Vergleichende Grammatik 160 a. 23 Probably phonetic variant of edir. The preterite of edēru, to be in misery, has not been found. If this interpretation be correct the preterite edir is established. For the change r > l note also attalaḫ < attaraḫ, Harper, Letters 88, 10, bilku < birku, RA. 9, 77 II 13; uttakkalu < uttakkaru, Ebeling, KTA. 49 IV 10. 24 Also na-’-[ -]ma is possible. 25 The text cannot be correct since it has no intelligible sign. My reading is uncertain. 26 Text uncertain, kal-lu-tim is possible. 29 Literally nostrils. pitik apunnati-šu, work done in his presence(?). The meaning of the idiom is uncertain. 31 Text has erroneous form. 33 Omitted by the scribe. 34 Sic! The plural of kakku, kakkîtu(?). 35 Cf. e-pi-ša-an-šu-nu libâru, “May they see their doings,” Maḳlu VII 17. 37 On the verb nâku see the Babylonian Book of Proverbs § 27. 38 The verb la’āṭu, to pierce, devour, forms its preterite iluṭ; see VAB. IV 216, 1. The present tense which occurs here as iluṭ also. 39 Note BUL(tu-ku) = ratātu (falsely entered in Meissner, SAI. 7993), and irattutu in Zimmern, Shurpu, Index. 41 Sic! ḫu reduced to the breathing ’u; read i-ni-’u. 5in the midst of omens. 7Like a … of heaven he fell upon me. 8I bore him but he was too heavy for me. 9He bore a net but I was not able to bear it. 11that heroes might kiss his feet. 13and they stood over against me. 18born2 in the fields like thee. 19The mountains have reared him. 25and reported it unto his mother. 27[dream. I beheld] my likeness in the street. 30and they assembled about him. 31Another axe seemed his visage. 32I saw him and was astounded. 34falling upon him in embrace. 2(Thus) Gilgamish solves (his) dream. 5[ ] forgot where he was born. 8and cohabited with the courtesan. 11“I behold thee Enkidu; like a god thou art. 13wanderest thou on the plain? 16even unto the holy house, dwelling place of Anu. 24He heard her speak and accepted her words with favor. 28and clothed him with it. 34unto the place of the ... of the sheepfolds. 3Food they placed before him. 19His thoughts became unbounded and he shouted loudly. 25He became like a man. 27even as does a husband. 30fells in the night time cruelly. 31He captured the wild mountain goats. 5“Oh harlot, take away the man. 6Wherefore did he come to me? 9and came unto him beholding him. 15is the fate of mankind. 17for a city. The trencher-basket put (upon thy head). 20open, addressing thy speech as unto a husband. 2and the harlot ..... after him. 3He entered into the midst of Erech of the wide places. 4The artisans gathered about him. 9“How is he become like Gilgamish suddenly? 10In form he is shorter. 11In ........ he is made powerful. 21he became for him a fellow. 4his hair growing thickly like the corn. 7They met in the wide park of the land. 10and permitted not Gilgamish to enter. 23He turned back his breast. 3 I.e., in the suburb of Erech. 4 patāḳu has apparently the same sense originally as batāḳu, although the one forms its preterite iptiḳ, and the other ibtuḳ. Cf. also maḫāṣu break, hammer and construct. 5 The passage is obscure. Here šuḫuru is taken as a loan-word from suģur = ḳimmatu, hair of the head. The infinitive II¹ of saḫāru is philologically possible. 6 I.e., an ordinary man. al (giš), al-gar (giš), a musical instrument, 187–191. See also No. 20 Rev. 7–12. al-bi, compound verb, 189 n. 6. In Ni. 8164 (unpublished) al-gar, al-gar-balag in list with (giš)-á-lá, also an instrument of music. ameliš, like a man, 215, 25. Amurrû, god. Psalm to, 118; 119.
apunnatu, nostrils, pitiḳ, apunnāti, 217, 28. Arallû, 132, 26; 134, 7.
arāmu, cover, 198 n. 2.
arāḳu, be pale, Prt. iriku, 217, 31. Aš-im-ur, title of Moon-god, 136, 12. áš omitted, No. 19, 2. Ašširgi, god, No. 22, Rev. 7. Deification of kings, 106–9; 127 n. 1.
dumu-sag, title of Tašmet, 163, 12.
dupšakku, trencher basket, 216, 17.
edēlu = edēru, be gloomy, 216, 10.
é-dub, house of learning, 117, 39.
é-gal, palace, No. 19, Rev. 3; 115, 11; 131, 7; 134, 22; 158, 9.
é-gig = ḳiṣṣu, 191, 11. E-kišibba, temple in Kish, 166, 13. Emaḫ, Ešmaḫ, ritual house of the water cult of Marduk, 163, 7; 115, 4.
en-a-nu-un, en-á-nun, title of Innini and Gula, 173, 2. EN-KA-KA, bêl dabābi, 194, 2. Enlil, god. Liturgy to, 155–184. Regarded as god of light, 157, 1 ff. 158, 3 f. Other references, 114, 19; 115, 2; 116, 19; 131, 6; 136, 5; 139, 40; 149, 22; 146, 3:7:14; 189, 11:19; 220, 33.
epû, be dark, I² itêpû, 196, 29. Erech, city, 125; 149, 13. Erech ribîtim, 212, 28; 213, 15; 217, 19:21; 217, 3:6.
eškar, fixed tax, 188, 9.
eš-lal, a sacred place, 161, 14. GAR-šunnu = epišan-šunu, 198, 13.
gašan-gula, title of Ninâ, 119 n. 2.
gi-gál(giš),interlude, 151 n. 1; 182, 33.
ḫanābu, grow thickly, Prs. ibannib, 219, 4.
ḫarbatu, waste place, 200, 39.
ḫûlu, a bird, 199, 31.
ḫûḳu, a bird, 199, 31.
iṣṣur šamê, unclean birds, 195 n. 10. KA-DIB-BI, sibit pî, 194, 10.
kasû, bind. I² liktisu, 198, 20. Keš, city, 115, 11; 123, 22.
kešda-azag, a relic, 132, 27. KI-AG-MAL, râmu, 194 n. 4. KI-SAR, ḳaḳḳara tašabbiṭ, 199, 29. Kish, city, 129, 30; 166, 12. é kiš-(ki)-šú, so read, No. 5 Obv. 8.
kurgal, “great mountain,” title of Sumer, 114, 11. Of Enlil, 114, 19; 182, 5.
la’aṭu, gore. Prt. ilûdu, 219, 12:17. Laḫama, goddess of Chaos, 113, 5.
libšu, garment, 214, 27:29; 215, 26.
limēnu, be evil. II¹ ulammenu-inni, 197, 7.
masû, seize, 195 n. 5.
mašû, to forget, 216, 7. Meḫuš, daughter of Ninkasi, 144.
mesû, a tree, 159, 23.
nâdu, water bottle, 198, 17.
nadîtu, temple devotee, 188, 7.
nagû, shout. Prs. inangu, 215, 19.
namaštû, cattle, etc., 213, 12:17; 214, 1; 219, 14. Ninurašâ, god, 191, 12; 146, 12.
nûn apsi, unclean fish, 195 n. 11.
nun-ùr, epithet of Amurrû, 119, 3.
patāḳu, fashion, break, 214, 4.
šaḫātu, be astounded, 216, 10. Arabic saḫiṭa. ṣai̭āḫatu, desire, comfort, 216, 18.
šakāpu, fell. I² išsakpu, 215, 30. Šamaš, god, 197, 4:8; 198, 10:13; 199, 25:31. Šamaš-šum-ukin, king. Incantations for, 193–200; 199, 23. Siriš, daughter of Ninkasi, 144. Siriškaš, daughter of Ninkasi, 144. Siriškašgig, daughter of Ninkasi, 144. ŠU-AN = kat ili, 194, 12. See also ŠU-dINNINI, 194, 12.
su-ud, sú-ud-ám, epithet of goddess of Šuruppak, 177, 10 and note 4.
šuḫuru, hair (? ), 215, 23. Šulpae, god, No. 16 II 22.
tapāšu, seize, capture, II² uttappiš, 215, 31. Ulmaš, temple of Anunit, 158, 13; 166, 3.
ursaggal, epithet for Ninurašā, 165, 11. For Enbilulu, 170, 5.
zâbu, flow. li-zu-bu, 198, 16. Cf. gàm = za’ibu, miṭirtu, words for canal, SAI. 691–3. zênu, be enraged, II¹ uzinu-inni, 197, 6.